Shri Vasudeo Sadashiv Joshi of Sitharam Co., accompanied by Shri Chidambara Rao Keshv Gadge Patil went to Shirdi to have Baba's darshan. They sta¬yed in Sathe's wada. Arati was being done to Baba's photo in Sathe's wada and Shri Vasudeo Sadashiv Josh! also attended the Arati. For him Baba has given dar¬shan as Narasimhamurthy in the Photo. He got this kind of darshan during the three consecutive days. On one day, both of them went to Baba for darshan and the latter gave them prasadam. They felt that the pra-sadam was insufficient to distribute it to their men in their native place. Then Baba gave Re. 0-8-0 to them and directed them to buy Prasadam in any shop in Shirdi and take it with them and added that any Prasad purchased in Shirdi is His Prasad. On another occa¬sion Baba gave them burfi Prasad. As it is very tasty, they wanted more and they went to the shop to buy it. Baba called them back and told that three basckets of Prasad was there, take two maunds from them. They went away to their place with Baba's Udi and Prasad. After some days, Shri Joshi sent his friend with Rs, 10/-as dakshina to Baba and requested him to take Baba's photo and return with Baba's Udi and Prasad. His friend went to Shirdi offered Rs. 10/- as dakshina to Baba and kept silent as he had no courage to take the photo of Baba. Baba, knowing this, He Himself asked Him to take His photo as requested by Joshi. Then he took one Baba's photo in sitting posture and one in standing posture, Baba has ordered him that the photos should not be sold in excess rate, they should sell only at reasonable rate and gave him permission tp go with His Udi and Prasad. That is how Baba has fulfilled the desires of His devotees. When Shri Raghuvir Bhaskar Purandare had first started to Shirdi, he requested his mother to accompany him. On the previous day of his departure, his daugh-ter has suffered from severe fever. Even then, he did not step his visit and came to Shirdi with his mother leaving his mother leaving his wife and disceased dau¬ghter at home. On the third day of his arrival at Shirdi, Baba appeared in his wife's dream in his house and applied Udi on the forehead of his diseased daughter. From that time, his daughter began to improve and became alright when he reached home. He knew this Leela of Baba and ever felt grateful to Baba. Shri Vamaii Chintaman Munge, Vakil of Pimpal-gaom Baswanth, Nasik District when plague was pre¬vailing in Pimpalgaom Baswanth, he shifted his residence to his house in his estate (i.e.) in his lands. One day night, thieves came there, made a whole and entered the house particularly in the place where Munge, was sleeping in a cot. Baba's photo was also hanging on the wall. The thief has lifted a small box under the cot and passed on to another thief stand¬ing outside the house. The small box contained a cash of Rs. 2CO/- (Rs. Two hundred only) and some promis¬sory note worth Rs. 4, OOO/- (Rs. four thousand only) The thief again came and was about to lift a big tiunk in front of the cot which contained jewels worth about Rs. 10, OOO/- (Rs. ten thousand only). In the meanwhile Baba appeared in his dream and woke him up stating that theives have lifted his belongings. His sister in-law also wake and they cried out loudly as "Thieves", "Thieves”. Then all the servants and watchmen woke up and chased the thieves. However, the thieves have escapped leavirg the big trunk. The next day the small trunk was found in a field nearby. The thieves have taken away the cash and left the promisory notes-During that day night, he got a vision in his dream that Shri Sai Baba, Shri Abdul Baba and another Fakir with strong personality appeared before him. Aftej some days, he visited Shirdi and took da.rsh.an of the same three persons of whom he has seen in his dream and he himself ascertained that the third Fakir was the Master of Shri Abdul Baba. After some days, one Shri Datta Brahmachari of Kopergaom has visited his house for meals and he told him that the lost properties will be available. Accordingly, Rs. 60/- and the other proper¬ties were seized aiid haridedover to him by police. The police have stated that the cmouut was seized and han¬ded over by them from a Marwadi along with some other theft articles. This clearly shows that Sai Baba was not only, safeguarding the interest of His devotees but also their belongings. Once it so happened in Shirdi that a bull dedicated to God Shivji roamed about in the village gardens and fields and destroyed the plants, standing crops etc. So people met together and decided to send away the bull to Panjra Pole (an asylum for old beasts) at Yeola and collected some fund for the purpose. They entrusted this work to Bhikoo Marwari of Shirdi in all good faith but the said Bhikoo Marwari proved treacherous. He did go Yeola as directed, but instead of taking the bull to that asylum, he sold it to a butcher for a sum of Rs. 14/- returned to Shirdi and calmly reported that he had taken the bull to Panjra pole and left it there. Baba knew how the bull was dealth with. So he appeared in one Shri Bayaji's dream and said "you have been enjoy¬ing sound sleep of rest. Have not you placed me in a butcher's hand?" Bayaji reported this to the village people, who, growing susppicious of the bonafides of the Marwari, deputed Bayaji to Yeola for investigation. Bayaji went to Yeola Panjra Pole, took complete search of it. Not finding the bull there, he went to the but¬cher's lane and looked about here and there. Fortuitou¬sly at this very time, the bull had raised up its head above a buscher's compound wall. Shri Bayaji saw this, he atonce recognised it (the bull), so he approached the butcher and requested him to return the bull, but he would not part with it as he has purchased it for Rs. 14/- and then took it (the bull from the butcher to the old beasts asylum and kept it there. On his return to Shirdi he acquainted the people with what Bhikoo had done and so to set a lesson to such sinful, faithless people as Bhikoo, Baba inspired them to prosecute him. Bhikoo had to undergo in jail for two months for his treacherous act. From this, it is seen that Baba had his Benign protective eyes not only on human beings but also on all creatures. In 1914, Sakarwadi (near Shirdi) Sugar Mill doctor Shri M, R. Tagare was proceeding to Kopergaom Post Office in bullock cart to encash his own war bonds of Rs. 2500/- while he was talking busily with a fellow passenger, the bag containing war bonds slipped down from the cart unnoticed by the doctor. As soon as he noticed that the bag had dropped down on the way, leaving the cart helter and shelter a mile or two in search of it, but without success. Uneasiness on account of this loss allowed him no sleep till about midnight when he thought of sitting near Sai Baba's photo he had in his house and praying, he seemed to hear someone telling him "cease worrying*'. This brought him peace of mind and he could then sleep. Nest morning, he had to attend upon an ill friend at a nearby village, so he went there, examined his friend, gave him medicine and casually talking to him about the loss of bag conta¬ining the said war bonds. A girl who standing nearby listening sympathetically to the docto'r's talk, ran at once and returned with a" bag saying that it was found lying on the road the previous day. Looking up the bag, the doctor found that the papers had all been dis¬turbed and turned up and down, the finder find nothing from the bag and that the war bonds were in tact. The doctor was over pleased and heartily thanked Baba for His favour and grace. "When Brahmadev has created this Universe, if we do not appreciate it, His ingenuity and skill will be in vain. He who has no evil thought in his mind, why should he fear any one? Eyes do their work of see­ing. Then why be embarrassed," said Baba to Nana Chandorkar (Sai Satcharitra Ch.49) when the beauty of a Muslim lady, who came for Baba's darshan, charmed Chandorkar. "I lost my eye sight I do not mourn its loss as it keeps me from seeing undesirable things. Yet, I yearn to see the Sagun Roop of my Lord, You. Therefore grant me sight till I am satiated at beholding your form. Then you may withdraw the sight again," prayed a devotee to Baba. Baba at once restored his sight. He looked at Baba with love and devotion for a long, long time. When he was filled with joy and completely satisfied he lost his sight again. Thus Baba fulfilled his wish. In Dadar, Bombay lived Vittal Yashwant Deshpande with his parents and grandfather. A tragedy brought him to Baba.His grandfather suddnely fell sick and gradually lost his sight. All sorts of rem­edies, treatments, doctors and vaids were tried. But, he became totally blind. Vittal was very fond of his grandfather and he helped him move around the house. There lived in Bandra, a Satpurush named Govind Rao Mankar. He was a devotee of Baba and advised the grandfather to go to Shirdi, and seek Baba's blessings for a cure. The grandfather was impressed by the Satpurush, and was determined to go to Shirdi. He requested his son to take him to Shirdi, but for some reason, the trip was postponed. In 1916, Vittal was just twelve years old. As his uncle was busy, it was decided that Vittal would take his grandfather to Shirdi. Before leaving, his parents repeatedly told Vittal to behave properly and take care of his grandfather. They reached Shirdi and went to the Dwarakamai. They took darshan and prostrated before Baba, who said, "Give Me Rs.6/- dakshina". Vittal thrust his hand into his pocket and found that he had a Rs.10/- and a Rs.5/- note. He gave Baba the ten rupee note, which He did not accept, nor would He ac­cept the Rs.5/- note, nor would He give him the change. Vittal tried again, but Baba stubbornly said, "Give Me Rs.6/- dakshina". So, Vittal brought his grandfather to the Sabha Mandap below, and seated him in a corner next to the wall. He went out to get the change. But try as he may, no one gave him the change. Frustrated and wondering how his grandfather was, he started crying. Suddenly, a well-built man stood before him. He had on a clean dhotar (Indian dress) a pagdi (turban), Poona shoes and chandan (sandalwood paste) on his forehead. Gently, he asked, "Child, why are you crying?" Vittal told him how stubborn Baba was and his inability to get change. Quietly, he gave him the change. Vittal ran to Dwarakamai and placed the Rs.6/- at Baba's feet "Daro mat, beta. Allah Malik achcha karega. Ab thumhara kaam hogaya" (Do not fear my child Allah Malik will do good. Now your work is successful). Vittal was astonished, but rather confused. He had not told Baba why he had come, nor had Baba asked him. He just stood there staring at Baba. Baba repeated the same words again. Still confused, he went to the cor­ner where he had seated his grandfather, but he wasn't there. He searched in the Sabha Mandap, but couldn't find him. Fearing that he may have walked out, he ran out of the Dwarakamai, but there was no trace of his grandfather. Again, he ran around the village, calling his grandfather, but he couldn't find him. Dejected and afraid, he started crying bitterly, wondering if his grandfather had fallen or hurt himself. Lo! The same man stood before him. "Why are you crying now?" he asked gently, patting Vittal on his back. Though sobs, Viittal told him what had happened. "Your grandfather is seated on the steps of Sathe Wada", he said, pointing in that direction. Vittal ran and found his grandfather happily seated on the steps, eating sugarcane. Angrily, he said "Why did you leave the place I seated you at? Suppose you fell and hurt yourself? How did you reach here?" the grandfather told him that as soon as he went to get the change, his sight started re­turning. "By the time you came back, I could see clearly. So, I came to the Wada". Vittal was relieved to hear this. He also understood why Baba asked for Rs.6/-only. The dakshina of Rs.6/- could possibly mean 'giv­ing unto Baba the six internal enemies (lust, anger, greed, pride, dellusion and envy) that thrive through the five senses (sight, hearing, speech, smell and taste). Especially sight (Sai Satcharitra Ch.16 'Shadripus') is explained. On the way home, he lost his cap, and was afraid to tell his grandfather about it. Finally, they reached Dadar. His parents were awaiting their arrival, when he turned around, his grandfather was missing. He collected all their bags and walked slowly towards his parents. They eagerly questioned him about the trip. He mumbled something, just then his grandfather arrived with a new cap. He was then filled with immense joy as he finally got proof that his grandfather could really see. "But who was the mysterious gentleman, and how did he know who my grandfather was?" he wondered. "Give up all anxiety. The moment you put your foot in Shirdi, your sufferings have ended. You may sink neck deep in the sea of obstacles, you may have sunk deep into the pit of sorrow and suffering, but know that he who climbs the steps of this Mosque will enjoy the greatest happiness. The Fakir of this place is very kind, He will eradicate your disease and pain. He who has compassion for all, will look after you very lovingly," said Baba to Bhimaji Patil of Narayangaon when he was suffering from pulmonary T.B. (Sai Satcharitra Ch.13). In Thajanpur Chebedi near Sinner, Nasik district lived Lakshman Baji Avare. In 1910 he suffered from terrible pain in both his eyes. The eyes watered con­stantly, and finally he lost his sight and became blind. All sorts of remedies and medicines were tried but of no avail. A friend of the family advised them to go to Shirdi. Have Baba's darshan, and assured them of a permanent cure. One Thursday they came to Shirdi and had Baba's darshan. Baba looked at Lakshman kindly and said "Allah Achchha Karega" (Allah will do good) and gave them Udi. They returned home, when they noticed that the watering and pain had subsided. So they made weekly trips to Shirdi every Thursday, and took Baba's darshan for six months. The villagers advised the mother to take her son to JJ. Hospital, Bombay for treatment. On the day of their departure to Bombay, Lakshman had a burning sensa­tion all over his body. Regardless, he left for Bombay. There a British ophthalmologist (eye doctor) examined him and told him that he would not regain sight as the eyes were badly damaged. With a heavy heart they returned to their village. Lakshman however, determined that whether he recov­ered his sight or not he would stay in Shirdi at Baba's side. The family came and stayed in Shirdi for some time, then the mother returned to her village leaving her son behind. Lakshman had intense faith in Baba. Every morning, he washed his eyes with the water that Baba used to wash His face with. This he did for one month when suddenly, his sight got restored, but not fully. One evening he took Baba's darshan in the Chavadi. Baba gently clapped His hands on Lakshman's chest and Lo! He could see clearly again. So over­whelmed with gratitude was he, that he stayed on in Shirdi till Baba's Mahasamadhi. Radhakrishna Mai asked Lakshman to pump water from the well (now in Saran Jame Baug) and do all the work that she ordered. This seva he willingly did as a token of gratitude for his recovery. From 1913 to 1915, Swami Sharan Anand saw a blind man in Shirdi. He was doing Hari Kirtan, and kept beat with his cymbals. In 1942 or 1943 he saw the same man reciting chapters of Shrimad Bhagwat Gita and singing verses from Dnyaneshwari's Amrit Anubhava. Curious about this, Swamiji said, "When did you get your sight back?" He replied "Through Baba's grace I received this precious gift. I had a blessed vision of Him years ago, and since then, I can see, read, write and move freely". To assure Swamiji he read out several verses from the Amrit Anubhava. How wisely he used the sense of sight! per­son who requests you to give him a span of space for sitting". The devotee agreed to Baba's strange request. He and his family were comfortably seated in the train. At every station, the man looked for the gentleman. But no such person approached him. At last, the train pulled out of Kalyan. The devotee thought that he should write to Baba about his non-compliance. Then the train halted at Thana. Just as the train was moving out, a man rushed into his compartment, drenched in perspiration. He gasped and said, "Please pick up your child and give me a span of space to sit as I am feeling giddy." The Konkani devotee readily picked up his child, and gladly handed over the packet of Udi. He told him of Baba's strange request, and as Joshi had said the very words, he handed over the Udi. Joshi respectfully received the Udi packet. He thought of Baba's kindness towards an angry child and was forever grateful. "Do coconuts produce children ? How can you be so superstitious?" said Baba to Shama (Sai Satcharitra Ch. 36). Shama was pleading with Baba on behalf of Mrs. Aurangabadkar. He beseeched Baba to give her the coconut and His blessings. Thus the barren lady might get a child. "She will get a child in 12 months," said Baba. This is another coconut Leela. A lady from Poona was desperate to go to Shirdi, and seek Baba's blessings. But, however hard she tried, her attempts failed, for some reason or the other. She was sure, if she received a coconut from Baba, she would get a child. She was very sad and dejected and wondered about the future. One night she had a dream vision. Baba came and gave her a coconut as prasad. When she woke up, and thought over the dream, it seemed so real, that she looked around. Lo! There was a coconut on her bed. She vowed that if she got a child by this prasad, she would take the child to Shirdi. A year later she delivered a male child; so she went with her child and grate­fully laid him at Baba's feet. Mention is made of Hari Bhau Karnik in Sai Satcharitra chapter 33. In 1917 on Gurupurnima he visited Shirdi and after proper rituals offered dakshina to Baba. While he was getting down the steps, he wished he had offered one more rupee. As he was given permission to leave, he proceeded to Nasik. There Narasimha Maharaj demanded, "Give me my one ru­pee" which . Haribhau gladly gave, realizing how Baba, had reclaimed the rupee. Before this visit to Shirdi he was once in trouble. His relatives dragged him to court unlawfully. Having heard of Baba he came to Shirdi. He bowed to Baba and offered a coconut, betel nut and dakshina. Baba asked him to go to the Wada and take rest. Two days later, he met Baba; he was dejected and sad at the behaviour of his relatives, and was thinking of the law suit. Baba, in His characteristic way, told him 'all about the case'. The other devotees asked him if he was ac­quainted with Baba. "No, I have not met Him before, but He surely knows me". On the fourth day of his stay, he met Baba who said, "Wait for six months and see the fate of the mischief makers!" True to His words, six months later he was acquitted and the troublemakers suffered much for their misdeeds. "In the Wada there are many thieves fasten the doors and be alert for they will rob you of all your belongings and attack you fiercely. Property is never permanent, as for the body, it is for ever transient knowing that death is near, conduct yourself according to Dharma," said Baba to Vijayanand Swamy (Sai Satcharitra Ch.31). Baba knew that he was going to die and alerted him to do the right thing by reading the Holy Scriptures. He said the same to Appa Kulkarni, who did not understand His words. "Thieves will come and fight with you. They are very clever in selecting persons, and will take away only what they want. Beware!" But Appa took trouble to safeguard his property. At that time, there was an epidemic of cholera in Shirdi. One night, Appa had incessant vomiting and diarrhoea and suf­fered from cholera. Soon, his body became cold, clammy and pulseless. Seeing his condition, Appa Kulkarni his wife ran to Baba and begged for Udi and blessings to save her husband. Baba calmly replied, "Do not grieve. Death awaits all those who are born. Birth and death are acts of the almighty. No one lives or dies here. If you look at the phenomenon of life with the eyes of wisdom, you will realize that you are no different. When the clothes become old and fade, you throw them away. In the same way, the soul, which is immortal, casts off the worn out body. Do not stop him from going. Let him leave as he has reached his life's goal. He will go to heaven. He is right now changing his clothes before Me." Then, his wife returned home, weeping, but com­forted by Baba's words. Appa died soon after. The vil­lagers were frightened, lest cholera spread in epidemic proportions. They came to Baba and begged him to stop the epidemic. Baba said, "Only seven will die of chol­era." After seven people succumbed to it, the disease abated. Tatyasaheb Nulkar was a sub-judge at Pandharpur. He was well versed in the Shastras and Vedas. He was a skeptic and thought it was not necessary for him to have a Guru. Once he had severe pain in his eyes during his visit to Jalgaon. As his brother was a doctor, he thought that he could readily get treatment from him. There he real­ized that Gurupurnima was three days away. So, without any remedy, he set out to Shirdi. Upon arriv­ing at Shirdi, he lay down in Sathe Wada for a while, before going for Baba's darshan. Inspite of the tormenting pain, he went to Dwarkamai for Baba's darshan. Baba in his characteristic way said, "Shamya, my eyes are giving me great deal of trouble and I am suffering too much pain". The moment He uttered those words the pain in Nulkar's eyes ceased. Nulkar stayed in Shirdi till his death. During the time of his death, Baba sent His Udi and Tirth to him thereby giving him Sadgati. Moreshwar Pradhan and his wife Chottubai loved Baba from the bottom of their hearts. Baba likewise reciprocated. He looked after their welfare in every way. Once all the children had chickenpox and subsequently they all recovered except the youngest, who was also the weakest. Then the illness took a serious turn. The doctors also gave up hope of child's recovery. The child turned pale and signs of collapse appeared on the child's face. The parents tended to the child lovingly, but with a heart full of sorrow. They chanted Baba's name con­tinuously. Chottubai suddenly fell asleep, only to see Baba before her. Baba said, "What is all this? The child is all right and safe. He will ask for something to eat at 6.30A.M. Do give him whatever he wants without fear." Chottubai woke up and looked at her child who seemed to have re­covered at that very moment, and was sound asleep. Exactly at 6.30 A.M. the child asked to be fed. The mother joyously gave him all that he wanted. The child Moreshwar Pradhan fully recovered in a few days. Lakshmibai and Janabai were grinding wheat with the hand mill, when a lady from Bombay entered Dwarkamai. She sat beside them, and asked Baba if she too could grind the wheat. Baba said that she would get tired. Nonetheless, she was eager to grind as much as was possible. Baba asked Lakshmibai to let her grind the wheat. The lady was full of questions, and was ea­ger to get answers from Baba. She started asking Baba, why the wheat was ground? Why He threw it at the village boundary? Baba said, "Akkabai Maaribai, Marriamma (i.e. dieties of cholera and smallpox) want to enter the village so I feed them on the other side of this village and prevent them from entering Shirdi. As they are propitiated, they do not enter Shirdi. Thus, I save My devotees." Then she asked whether there was 'Jari', 'Mari' (durdevatha=evil forces). Baba said, "Yes, there ex­ists durdevatha; but they will not do any thing to us." She said that some people are dying because of durdevatha. To this, Baba said, "Durdevatha was scold­ing Me and insisting that she be allowed to enter this village so I requested the Almighty to give her the al­lotted person." "Are there evil spirits, Baba? When I was in Naigaon, in Bombay, an evil spirit would come from the side of the well and go to the room upstairs and disappear." The Omnipresent, Omniscient, Baba re­plied, "Yes. But they will not do anything to harm us." Then Baba told her that the spirit she saw, was that of the owner of the house. "He comes and goes upstairs and disappears where you delivered". The lady was astonished to hear all these facts and asked Baba how He knew them. "I know you from child­hood, you have forgotten Me, but I do not forget. I call all My children to Me even if they are thousands of miles away. I look after all equally, be they good or bad." After a while she felt tired and asked Lakshmibai to resume the grind­ing. The lady returned to Bombay unafraid and assured of Baba's love and protection for her and her family. In 1917, during Vaishak month a doctor, his wife and son came to Shirdi. He hoped that Baba would drive away the evil spirit that tormented his son. In the Dwarkamai, the doctor thought that Baba's grinding of wheat and throwing it at the outskirts was futile and just a superstition. Baba reading his thoughts asked him to come at 3.00 P.M. Exactly at 3.00 P.M. he and his family went to Dwarakamai. The doctor and his son sat and started massaging Baba's legs upon Baba's orders. Just then, an ugly, devilish looking lady came and grabbed his son, wanting to take him away. Baba, undaunted, gave her a blow with His satka. She fled, crying loudly. Baba then said, "She came to eat your son. She was deprived of her ration. I did not throw the flour at the outskirts today, as you thought it was unwanted. But I drove her away with My satka. Now she will not torment your son". The father and the son were filled with awe at Baba's Antarjnan and kindness. Then Baba gave them permission to go on the next day. In the Sai Satcharitra, Ch.29, the Leela of the ava­ricious Bhajan Mandali from Madras is given. Some of the details like their names, address, and other par­ticulars are missing. The Leela given below elaborates upon it. He was called Bhau Swamy because his Guru was Ram Bhau of south Kanara. This Govinda Swamy worked in Madras Electric Tramways. He and his fam­ily went on an all India pilgrimage in 1915. 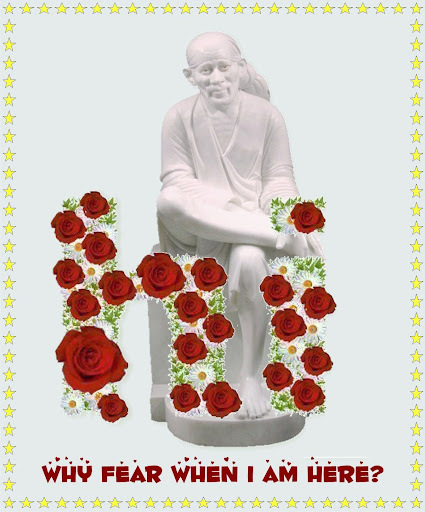 They vis­ited Shirdi on 23.8.1915. They sang beautifully and did bhajans daily. Baba gave them Rs.2/- and two ru­pees worth of burfi. The burfi he sold for one rupee and twelve annas. All these details he wrote in his di­ary daily. One day, he had a dream vision of Baba (which is elaborated beautifully in the Sai Satcharitra). After this revealing vision, the greedy skeptic became an ardent devotee. Dr. Pillai asked him to write his dream, which he did, and handed it over to him. Knowing of Radhakrishna Mai's love for bhajans, he performed bhajans in her home too. She gave him a Marathi book containing the life of Baba, which he treasured. His wife Adilakshmiamal was given sakshatkar (vi­sion) of Sri Ram at noon Arati while the rest of the Mandali saw Baba sitting in his usual place. Filled with joy, she decided to make prasad of Bhaaji and Payasam for Baba. On 30/08/1915, while preparing it, she fer­vently prayed to Baba to accept it, as she had prepared it with all her love and devotion. Eagerly she took it to Dwarakamai and handed it over. To her utter conster­nation, the lady (Durga Bai) placed it last in the rows of Prasad offerings. Baba however, slowly moved to the back, and opening her dish, devoured the whole of it with great relish. This touched the lady to the bot­tom of her heart further strengthening her devotion in Baba. The story of Dr. Vir Hate and the one rupee is given in Sai Satcharitra Ch.29. A little more is given here about him. Capt. Dr. Hate was a staunch devotee of Baba and lived in Shirdi for some time, and then returned to Gwalior. One day, Saval Ram of Gwalior came to him distraught as his son was missing. Dr. Hate said, "Go to Shirdi and take Baba's darshan and you will surely find him". Saval Ram agreed. After some time he re­ceived a letter from the boy saying that he was in Egypt. He had secretly joined the army, as he feared his par­ents' wrath. Now he was returning to India. Saval Ram's joy knew no bounds. But instead of going to Shirdi, he and his wife went to Bombay to receive the boy. When they met, Saval Ram was upset, as his son was emaciated and suffering from high fever. He rushed with the boy to Gwalior for treatment. Again he told Dr. Hate about it. The doctor chided Saval Ram say­ing, "You failed to keep your promise. Now take the boy to Baba and he will be alright". The three of them then set out to go to Shirdi. Just before they left Dr. Hate gave one rupee to Saval Ram and said "Place this in Baba's hand. Do not fail to bring it back". He wanted the blessed coin to keep in his Puja. Saval Ram returned with his family and told Dr. Hate that his son was recuperating. He also gave the rupee to Hate. On receiving the coin Hate felt it was not the same coin he had given. Disappointed, he told Saval Ram to go back to Shirdi and fetch his coin. On returning home Saval Ram told his wife about the inci­dent. She however, just went inside and brought Dr. Hate's coin, which she had put away safely. The next day a thrilled Dr. Hate received his prasad (coin) and Saval Ram apologized for the substitution. He related what had happened and Dr. Hate was satisfied. Page created in 0.537 seconds with 69 queries.